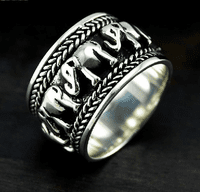 Handmade Sterling Silver Elephant Spinning Lucky Ring for Men. Handmade Sterling Silver Elephant Spinning Lucky Ring for Men. This Thailand elephant ring for men is handmade by the artisans from the Hill Tribes of Thailand from Thai sterling silver. Elephant represents good luck, safe and sound in the Thailand culture and the Asian Feng Shui culture.